Buried in the news of United’s excellent financials was a new Boeing aircraft order. As the airline continues to expand, United has placed a firm order for 24 additional 737 MAX aircraft and four additional 777-3o0ER. The deal was actually signed last month, but only made public during the earnings calls earlier this week. This comes in addition to the 154 737 MAX aircraft already on order from United. At list price, the new aircraft deal is worth about $4BN. There is no doubt, however, that United paid much less. In the annual horse race between Airbus and Boeing, last-minute orders like this helped to put Boeing over the top. Boeing ended 2018 with 803 orders while Airbus ended the year with 747. 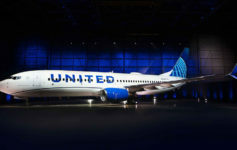 United Airlines has been instrumental to the phenomenal success of the Boeing 737 and 777 programs over the years. We are honored by United’s continued confidence in our people and our airplanes and services. We are proud to again extend our long-standing partnership with United Airlines with these latest orders. With an announced international and domestic expansions, United will need these aircraft to operate all routes and continue to expand. What’s the market for the 737 MAX? I know there’s only a few on UA currently but I never see as an option out of DEN. Is it east coast-Europe to replace 757s on less popular routes? Or North America – South America routes? its based in LAX and Houston I believe. a MAX9 does a daily run out to HNL from LAX. Since UA has recovered financially, it is time to order more wide-body jets, and reinstate transpacific flights yield to Asian airlines since 9/11 tragedy.